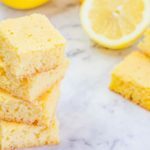 Our buttery Keto Almond Flour Blondies Recipe has a " Sweet & Zesty Lemon" flavour from our Sugar-Free Lemon Curd. A delicious, easy melt-and-mix recipe. Line an 8x8in cake tin with parchment paper and set aside. In a mixing bowl add the melted butter, natvia, baking powder and vanilla and mix well. Add the Lemon Curd, zest and eggs and combine before adding the almond flour. Spoon the mixture into your prepared cake tin and spread evenly. Leave to cool for 20 minutes before slicing into 16 pieces and enjoying.